CES 2010: Naim expands its streaming range with the smaller, even more affordable UnitiQute | What Hi-Fi? 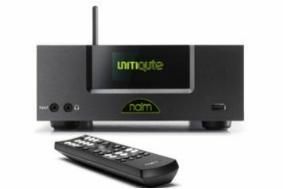 Selling for £1350 when it goes on sale in March, the UnitiQute is a complete all-in-one 'just add speakers' system in a neat 'half width' non-magnetic, non-resonant case. It can receive FM, DAB and internet radio, stream music from UPnP network storage, PCs or Macs, connect digitally to iPods or play music from MP3 players or USB memory sticks. In fact all that's missing is the NaimUniti's CD player. The UnitiQute also offers two analogue inputs – one on conventional RCA connections to the rear, the other on a combined digital/analogue 3.5mm front-panel socket – and has five digital inputs capable of handling signals up to 24-bit/192kHz. Both Wi-Fi and Ethernet connectivity is built-in, and the UnitiQute can play WAV, MP3, Windows Media, AAC and FLAC from suitable UPnP devices, plus WAV, AAC, MP3 and Apple Lossless from an iPod. The UnitiQute has 30W per channel output into 8ohms, a switchable bass contour for low-volume listening, bass management for use with an active subwoofer, and a touch-logo mute facility. Other connections extend to a headphone socket and a 75ohm digital output, and the UnitiQute has an OLED display and full remote control. See the Naim UnitiQute in our CES 2010 video report.